Tens of thousands of people showed that we don’t need capital or governments to get things done. They demonstrated the will of people to take part in comforting each other, re-building, creating and moulding their own futures. …efforts of communities hit by disaster that do not wait for the state, or allow capital to take the initiative, but instead ‘negotiate with their hands’, rebuilding their own communities and ‘healing themselves’, resulting in communities that are stronger. I call these efforts disaster communism. We think disaster communism is a useful concept for thinking about climate change. Although it's far from common, we can already identify at least two different meanings of the term. The first meaning is collective, self-organised responses to disaster situations. The second concerns the prospects for an ecological society based on human needs in the face of climate chaos, or to put it another way, the possibility of communism in the Anthropocene.1 We can call this first sense 'disaster communities', and the second 'disaster communisation', and consider both of these as moments of the wider problematic of disaster communism. For Solnit, the current social order requires constant effort to maintain. She likens it to an electric light, and disasters to a power cut. When the power goes out, literally or metaphorically, there is a spontaneous “reversion to improvised, collaborative, cooperative, and local society” (p.10). The repressive actions of the state – in San Francisco 1906 as much as Katrina in 2005 – are about reimposing state power and capitalist normality. An opportunity for social transformation? Importantly, disaster communities are not intentional communities, drop-out communes, or activist temporary autonomous zones. They're self-organised, non-market, non-statist social reproduction under adverse conditions, not an attempt at voluntary secession from capitalism. However, they still suffer some of the shortcomings of such projects. First and foremost, they are typically short-lived, even if the experience changes the participants for life. Fritz points out that practically, such communities persist until some kind of basic societal functioning and stability is restored, typically a matter of weeks to months in peacetime disasters, or several years in wartime or in case of chronic or serial disasters. Disaster communities alone, then, do not inherently pose a revolutionary threat to the capitalist social order – and may even be recuperated as a low-cost means to restore capitalist normality. If they can be called communist, it’s in the sense of ‘baseline communism’, a term used by David Graeber to describe the basic sociality and free cooperation which makes any social order possible (including capitalism). In part two of this article, we’ll look at what disaster communism means in relation to a wider revolutionary, anti-capitalist dynamic. 1. Jason Moore argues that "as a metaphor for communicating the significant – and growing – problem posed by greenhouse gas emissions and climate change, the Anthropocene is to be welcomed", but that in pinning the problem on 'anthropos' - humanity - rather than specific forms of social organisation - capital - it naturalises the problem and smuggles in neo-Malthusian assumptions. 3. We’re not claiming people are angels, only that the evidence consistently shows co-operative, pro-social behaviour is the predominant response. However, this solidarity is mediated by identity, and this means race is a major factor in who lives and who dies. The media like to focus on exceptional cases to fit a Hobbesian narrative of anomie wherever state order breaks down (e.g. see this Daily Mail piece), but cases like this are perhaps better understood as the effect of racial othering – when a black person knocks at the door asking for help, white people don’t necessarily answer, and maybe they even shoot them dead just to be sure. 4. For example see this blog by sometimes explode, arguing that anxiety/nervousness is the dominant affective state in the contemporary ‘society of stimulation’. 5. James Lovelock argues along these lines, linking anxiety to a sort of calm before the storm, which can only be resolved once the inevitable happens: “Humanity is in a period exactly like 1938-9, he explains, when "we all knew something terrible was going to happen, but didn't know what to do about it". But once the second world war was under way, "everyone got excited, they loved the things they could do, it was one long holiday ... so when I think of the impending crisis now, I think in those terms. A sense of purpose - that's what people want. "” We can’t share the nostalgia for wartime, but a sense of impending doom certainly pervades contemporary culture. 6. As an article in the Endnotes journal comments, "resilience is only ostensibly a conservative principle; it finds stability not in inflexibility but in constant, self-stabilising adaptivity." In disaster communities, neither state power nor supposed entrepreneurial 'genius' can generate this adaptive self-organisation, rather they act once it has stabilised the situation. Most disasters produce a great increase in social solidarity among the stricken populace, and this newly created solidarity tends to reduce the incidence of most forms of personal and social pathology. Great piece, look forward to reading the rest. One historical example I've seen referenced a lot is of working class self-organisation in the wake of the Mexico City earthquake (in 1985 IIRC) but I haven't seen much written about it. If there is a good (ideally short) history anywhere we could put on libcom anyone knows of that would be great. If anyone else has good links on this kind of thing (or well supported counter-examples of mutual aid not prevailing), please post them up. We'll post up part 2 in a week, and probably part 3 the week after. Part 2 looks at 'the big picture' a bit more, about what communism means at a world scale (in terms of 'communisation' and utopia). Then Part 3 tries to pull these micro and macro perspectives back together, by looking at the recent debate about global logistics and whether it can be taken over to communist ends. Occupy Sandy; see chapter 3 of this MA thesis. I really hate the title, but like the contents. "If those details were disclosed, 'the American Red Cross would suffer competitive harm because its competitors would be able to mimic the American Red Cross's business model for an increased competitive advantage,' Levin wrote." 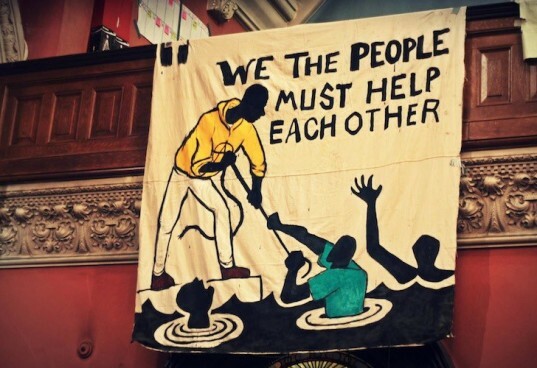 Article on Occupy Sandy and its relation to the state, in some ways responding to this series. Might interest some of ya'll.